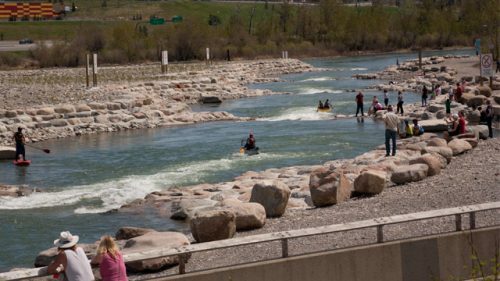 The Calgary River Access Strategy promised river users two new boat ramps at Inglewood and Ogden Bridge, improvements at West Baker Park and Graves Bridge, and improved access at Sunnyside. Once these Priority Access Points are completed, river users would be able to float the entire lower Bow River from West Baker Park in northwest Calgary downstream to Carseland to the east of the city. UNFORTUNATELY, the City has made very little progress in 2017 and 2018. As of the Fall of 2018, there have been some improvements at West Baker, Graves Bridge and Shouldice Park has been opened to trailered-boat access, but nothing has been done at Inglewood, Ogden Bridge, or Sunnyside. Go to the Calgary River Access Website for updated information. The following Google map shows the existing and the future river access points on the Bow and Elbow River. Click on the white box at the top right to expand the map. Hand Launch Boat Ramps – A total of 4 boat ramps that are assigned to only Emergency Services vehicle use. They are available only as hand launch sites until upgrades are complete. Priority Boat Ramp Development – Calgary’s River Access Strategy has proposed 3 new boat ramps for completion within 3 years. Future Boat Ramps – Four sites have been identified for future development. Elbow River Hand Launches – Very popular for float tubing. Road side parking and parking lots are limited at some sites. Glenmore Reservoir Ramps – Glenmore Reservoir is a centre of rowing, sailing and paddlers activities. Conservation Areas – There are 2 wildlife conservation reserves on the Bow at Inglewood Bird Sanctuary and Poplar Island Wildlife Reserve. Access to these sites from the river is prohibited. Harvie Passage was reopened to the public in the summer of 2018.